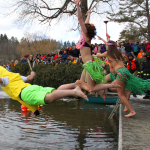 Photo compliments of the Blowing Rock Chamber and Winterfest! 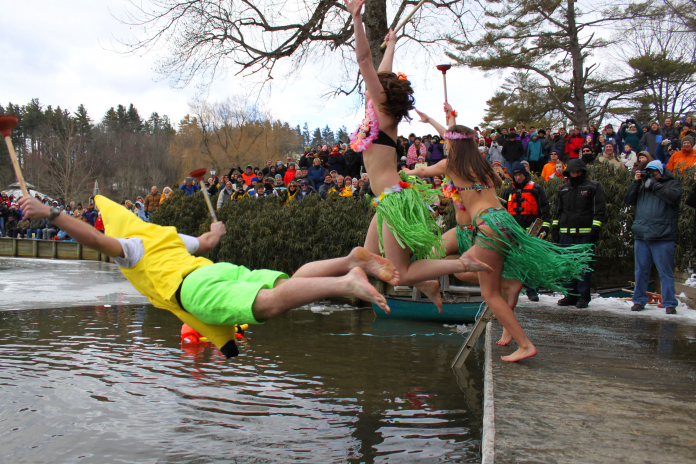 The Photo of the Day, up top and at the end of this post is from the Blowing Rock Winterfest and the Chetola Lake Polar Plunge! Thanks to the Chamber for the photo. We were hoping to get a new LIVE Stream in place for the event, and that camera is coming online soon…so next winter it will be cool to share. Speaking of COOL… it was 17° at Blowing Rock this morning with wind chills in the single digits for the cold plunge. Brad Panovich is at the Blowing Rock Winterfest and he is making snow over at the park until 1pm today. He plans on sharing some photos and perhaps a video or two. I PLANNED on being over there for that and perhaps to video share the Polar Plunge, but I am fighting a slight head cold and decided not to push it. We will try to get you guys some shares from over there. 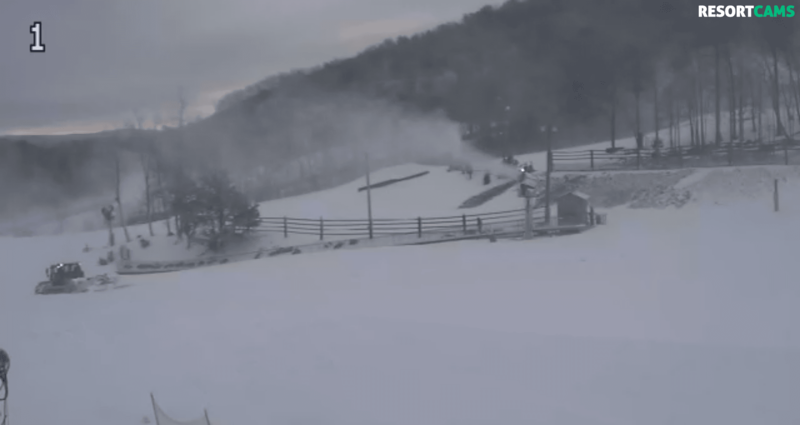 Here’s a quick share of the LIVE STREAM that Kenny Griffin did this morning from Beech Mountain. Be sure to click the Volume ON. …man gotta LOVE technology these days! Winter is Here in Full Force! 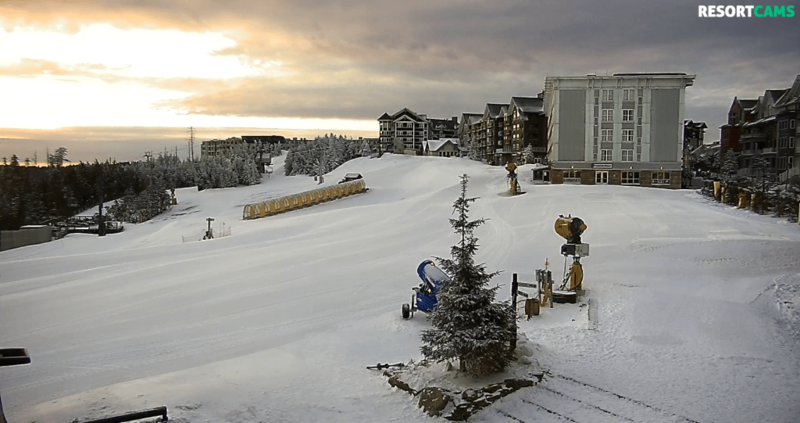 Snowmaking and icy cold temperatures dominate today’s FirsTrax news. I did a tour of the resortcams first thing this morning and at every stop I saw snowmaking going on. 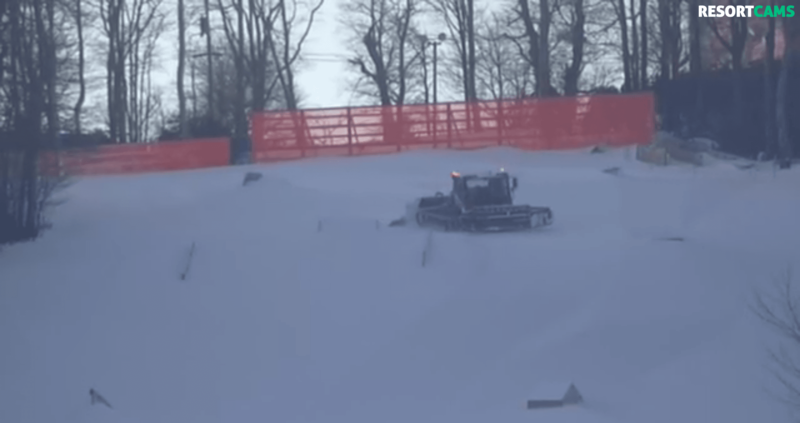 That includes Snowshoe Mountain who had a short PAUSE on snowmaking after a power outage last Saturday prompted the local power company to request that Snowshoe hold off on any snowmaking until they could get some repairs in place. 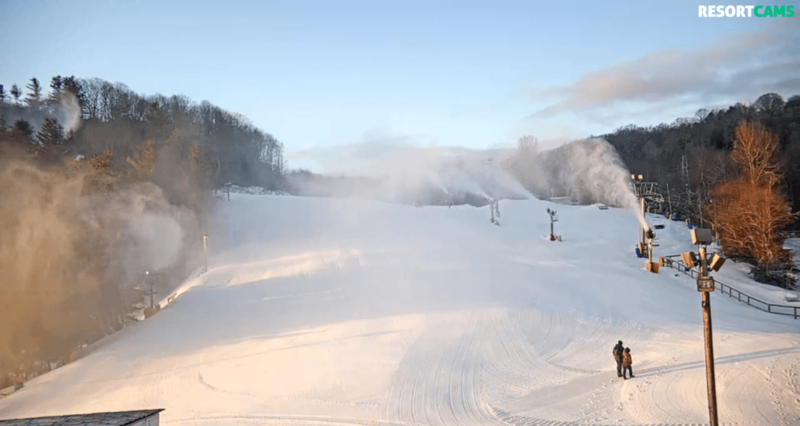 Those repairs were completed on Friday afternoon and Snowshoe is back in the business of making snow. 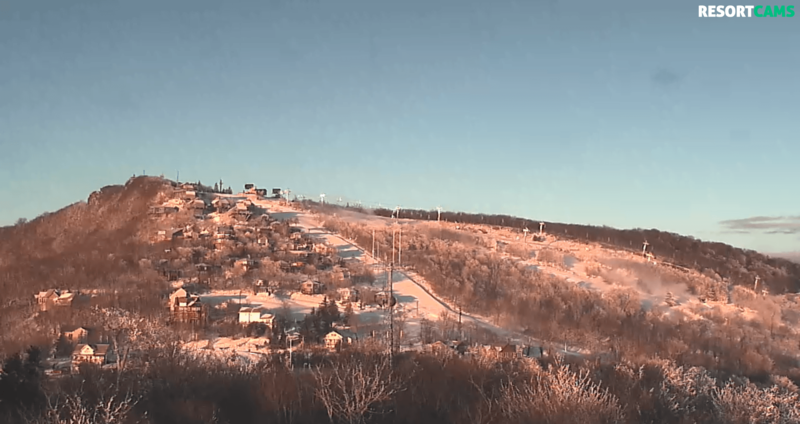 As I already mentioned, it seems that every resort is in the business of blasting the slopes this morning and with the cold temps that we’re seeing this morning – that snowmaking is pretty primo in that it will almost have a powder quality to it. 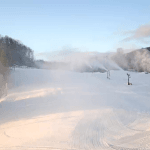 While on the subject of snowmaking, Appalachian Ski Mountain has now generated a base in excess of 105″ across their mountain and they have everything open that could be open. 100% for App. 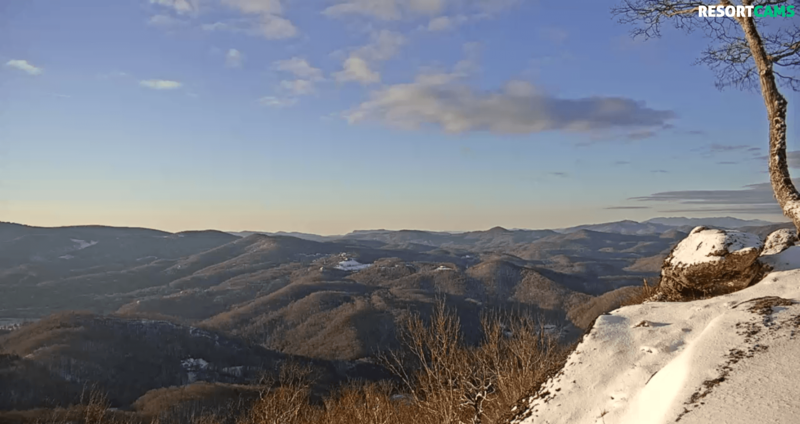 Beech Mountain has increased their trail count to (12) for today and in addition to Upper and Lower Robbins Run being open, they now have Lower Southern Star open. 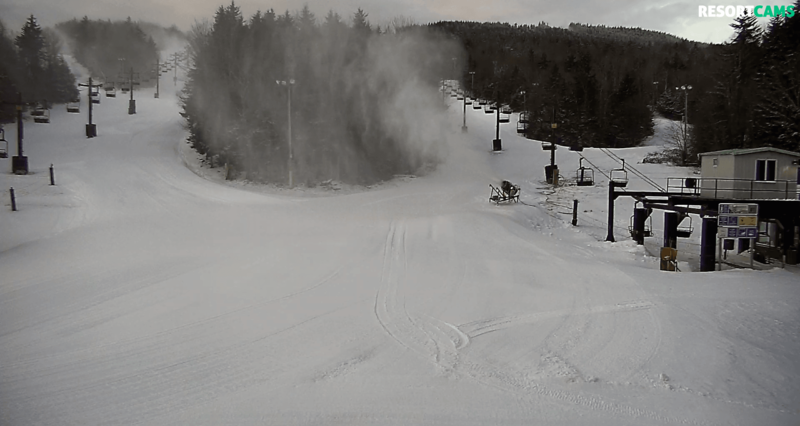 Snowmaking is happening on unopened terrain as well, so with the cold temps, I’d expect more to open so. Maybe White Lightning? Maybe Oz? We’ll see. Bryce Resort is open with 7 of 8 trails and they made snow – according to their website. Check out this awesome video from Bryce the other day! 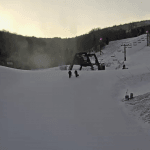 Canaan Valley Resort is playing on 21 of 47 trails until 6pm today.They are making snow on numerous trails across the mountain, with Gravity expected to open early next week. While we weren’t looking, their natural snow total for the season hit the 60″ mark! There’s a WHALE of snow at the left edge of this photo! Click to Enlarge! As many of our readers have shared this season – Justin Harris has really amped up their YouTube Channel and video shares this season. Now if every other resort would do that! 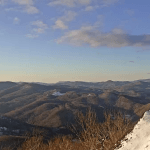 Cataloochee Ski Area is 100% with 18 of 18 trails open. Man they were bombing the slopes this morning. They did share that they don’t plan on making snow on their main trails today…and as Tammy shared, “It IS going to be a great Saturday to be at Cat! Cat was blasting some snow this morning! Click to Enlarge! 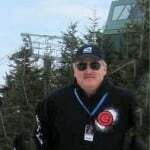 Massanutten Resort – Our David McCue will be skiing at Massanutten on Sunday. He’s in luck because with the opening today of Upper Mak Attack that takes Mass to 100% open! Ober Gatlinburg is rocking these next few days. They are making snow and 80% open with 8 of 10 trails open. 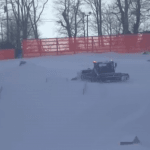 Snow tubing looks awesome and of course they have the region’s best ice rink. Since we have these great cold temps, we will continue to make snow as temperatures allow. As you all know it’s a must at this point in the season. If we don’t make snow, we run the risk of not having enough snow and cutting our season short… (remember last year!! )… For now, please plan for snowmaking as we are simply doing what we can to ensure a great season! 1/26: King of the Mountain. Today we will crown a new KING of the Mountain & QUEEN of the Mountain! Click Here to learn more! Sapphire Valley Resort – 100% open and boasting their best conditions of the season! 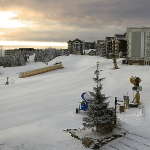 Snowshoe Mountain – 10° and they saw another 1″ of natural snow over the last 24 hours and they are making snow at numerous spots around the mountain this morning. By the way, THEY are now at 70″ of natural snow on the season after 9″ fell this week! Our snowmaking team is back at it as well and if temperatures continue to cooperate we should be 100% open very soon. Timberjack is open with a fresh new build at Silver Creek. Evolution is open as a ski trail without features(Build coming next week!). Snowmaking may be in progress on limited open terrain today. The Coca-Cola Tube Park is open from 11AM to 9PM with good old fashioned family fun in the snow! Omni Homestead Resort – They are open and looking the best they have all season with 7 of 9 trails open and mini-snowmobiles, etc. Timberline Resort is climbing off the mat and making headway in getting open with more to offer. They currently show 6 of 40 trails open until 9pm tonight. 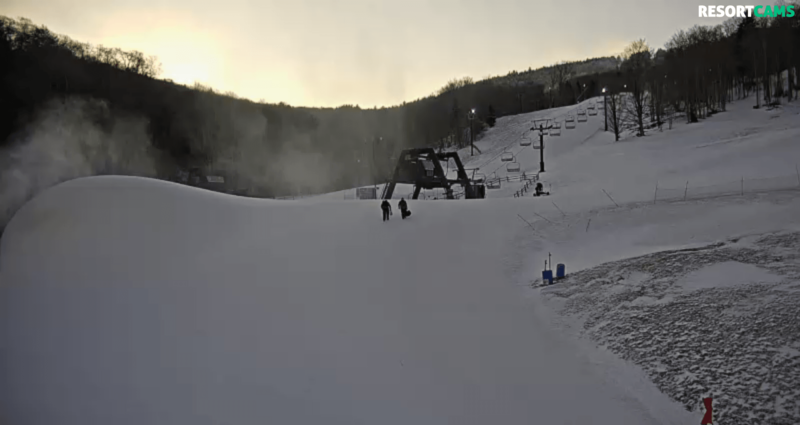 They are sharing that they should be open with 7 trails (including Upper Dew Drop) Opening Today. 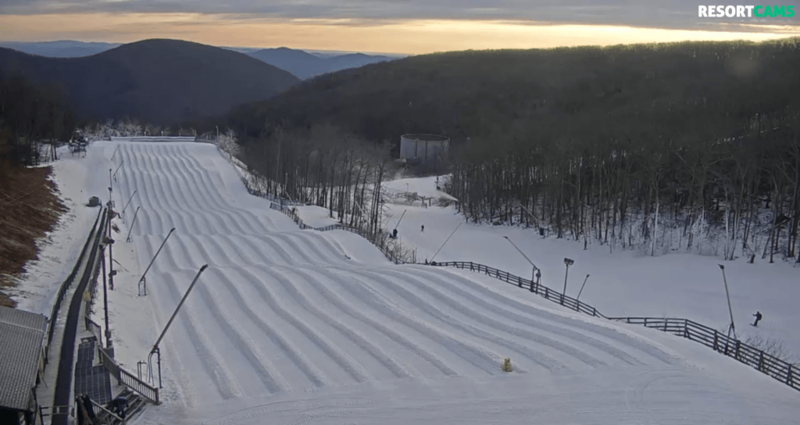 Wintergreen Resort – They are ramping things up with 20 of 25 trails open today and tonight. 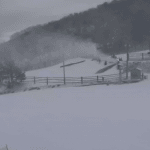 SkiSoutheast’s David McCue is skiing at Wintergreen today so we expect to see some awesome photos. Click to Enlarge! Wintergreen’s tubing hill is second to none! Big Acorn lift is running which means we will have 20 slopes open and 4 lifts. SNOWPOWER has been working hard and it shows. Conditions are currently some of the best of the season. If your not on your way already, grab your gear and head this way! Once you’re done carving up the slopes try your dance moves out at the Silent Disco in the Terrace Cafe inside the Mountain Inn (Wintergreen’s latest craze) There are also some spots left for SnowCat rides (an exciting trip around the slopes on the monster grooming machine) then join us for some live music at The Edge. 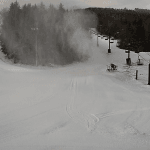 Winterplace Resort has also ramped up with more terrain open today. They are now playing on 22 of 27 trails. Wisp Resort is now open with 28 of 34 trails, snow tubing, ice skating, mountain coastering and great conditions. 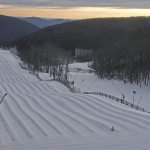 Wolf Ridge Resort is open today and tonight with 8 of 15 trails and snow tubing. As mentioned, it was COLD this morning. Here were just some of the temps I saw from around the region. Nice view of Silvercreek this morning! Previous articleBrad’s SkiSoutheast Skier’s Forecast; Cold & Snowy! 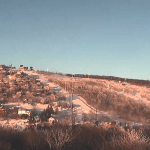 Next articleBeech Mountain Summit Cam back up!